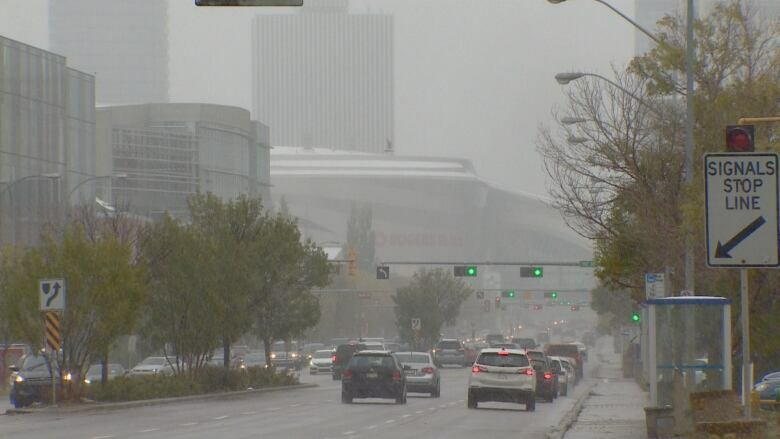 Edmonton police are urging motorists to slow down and drive appropriately for the road conditions after reporting 68 collisions took place across the city on Saturday between 9 a.m. and 5 p.m.
Edmonton police are urging motorists to slow down and drive appropriately for the road conditions. Scott Pattison, a police spokesperson, said 68 collisions took place across the city on Saturday between 9 a.m. and 5 p.m.
Four incidents resulted in injury, police said, but did not elaborate on how serious the injuries were. There were 12 hit-and-run collisions and 52 involving property damage. Slippery conditions began in the morning and stayed that way throughout the day. Collisions involving several vehicles closed parts of the Yellowhead Trail earlier in the morning. Police warned people that as the temperature drops later in the evening, some roads could become icy. The Environment Canada forecast calls for snow ending early in the evening and a low of –2 C.
It's expected to warm up on Sunday to a high of 10 C with sunny skies.